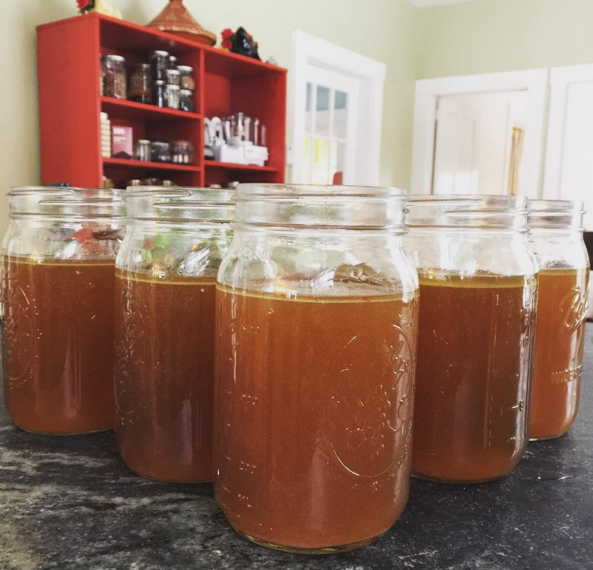 When I shared a photo of my latest bone broth stash on Instagram a few weeks ago, I got a lot of requests for the recipe. One of the things that I secretly love about making broth is that it’s inexact. I spend the vast majority of my time in the kitchen, measuring and timing things so that when you try to recreate the recipe at your house, it works. But bone broth is less precise, and it really can’t go wrong. This is how I make my chicken broth every few weeks. Sometimes it gels, and sometimes it doesn’t, but it always tastes great, and I know it’s loaded with nutrients. This recipe produces somewhere between 8 and 10 quarts of broth, which I then usually turn into Chocolate Chili and Silky Gingered Zucchini Soup. This same technique also works with 6 pounds of beef bones; just follow the rest of the recipe as written. If you use beef bones, you might want to roast them in a 450F oven for 20 minutes before making the broth. Stockpot: I have an enormous stock pot. It’s this one, and it’s 16 quarts. You don’t have to buy a behemoth pot like that one, but I’m lazy and like to make a giant batch all at once. Jars: If you’re going to be serious about making broth, you’ll need some of these quart-size Mason jars. Other chicken parts: KOL Foods, Slanker, and US Wellness Meats all offer chicken soup bones and US Wellness Meats sometimes has feet, too. I usually roast a whole chicken or some bone-in thighs and save the bones instead of buying chicken soup bones. The Witch Bag: I have a freezer bag that I use to store chicken bones from any birds that I roast, along with the ends of celery, carrot butts, and bedraggled parsley. Dave calls it my Witch Bag because it looks a little bit like a horror show, but those somewhat unappetizing leftovers turn into beautiful broth. As I alluded to at the beginning of this post, there are lots of ways to make broth. This is the pattern I’ve settled into. But you can use this post as a guide, not a rule book. Happy brewing! Place the chicken feet, wings, and other bones in a large stock pot. Add the cider vinegar, bay leaves, and peppercorns, then add water to the pot to cover the bones. You don’t want a ton of extra water in there, but you want a few extra inches of coverage at the top because it will evaporate as it cooks. This is an eyeball-it thing; don’t stress. Place the pot on the stove over high heat and bring to a boil uncovered, then immediately reduce the heat to a simmer and remove any foamy stuff that’s formed on the top. Add the onion, carrot, celery, parsley, and garlic to the pot; stir to combine. Cover and simmer for 24-36 hours. I check the pot every 4 hours or so (except for overnight when I’m sleeping), and I adjust the temp so that it’s barely simmering. There’s hardly any movement on the surface of the water, but if I bump the heat up, it immediately starts to move. When the brew is finished cooking, let it cool a bit, then strain it. I manage this by placing an extremely large wire strainer in an equally-large bowl inside the sink. Then I carefully tip the stockpot and pour the broth into the strainer/bowl. I can do about half the pot at once. Then I ladle the broth into Mason jars and repeat the strain/ladle process until it’s complete. Be sure to leave room at the top of the jars for the broth to expand! I put the jars in the fridge—with the lids on loosely—to cool for a few hours, then tighten the lids and transfer them to the freezer. To use the broth, let it defrost in the refrigerator, then go about your business. It will make your favorite soups taste even better than before, and on its own in a mug—maybe with a little ghee and dried chives—it’s restorative. If you cannot deal with all of the above, or simply run out and need broth in a hurry, these brands are high-quality and taste really good. Pacific Foods Bone Broth — available at regular grocery stores! The smell of simmering broth makes my partner gag (tragic, I know), so I super appreciate the commercial suggestions. Thank you! Do you skim the fat off the top of the broth before freezing? And do you want to see a slight simmer in the pot or leave the heat low enough that you don’t see anything? The fat will solidify as the stock cools. If there’s a lot, I usually remove it, but if it’s a very thin layer, I keep it because it adds such great flavor. I usually have a VERY slight simmer — just a tiny bit of movement under the surface. It freaks me out when it’s just sitting there like a still pond; I imagine yucky things growing in there because it’s not hot enough. I have the same problem so I make mine in my crockpot in the garage!! We use a crock pot, but the crock pot was running 225°, it too was a bit gaggy, I made this control box, effectively making a Sous Vide cooker. We cooked our chicken at 165° and the smell was wonderful. The bird was done a little longer at that temp. Boned the bird and put all bones back in the crock pot for 3 days of heavenliness odor and a beautiful golden brown broth. I do pretty much the same thing, but I add a few peppercorns. My witch bag also includes onion peels. I think Pacific which may be different than Pacific Foods might have yeast, sugar and Carmel color. However you did not mention Kyichen Basics. I think it is pretty clean. Pacific Foods Organic Bone Broth (different from regular Pacific Foods organic broth) contains only organic chicken, onion, cider vinegar, and rosemary extract. Love the witches bag description! What a great way to describe such a concoction of scraps:). My husband Dave is pretty funny. Also, I got this idea from another person, but try freezing some of the batch of broth in ice cube trays, then popping out and storing in a Ziploc. Then you can add just the amount you need for recipes without thawing a whole jar! I’ve been making “Egg Broth” for breakfast. 1 cup boiling bone broth, 2eggs, salt, pepper, ginger, onion powder. Use an immersion blender to blend hi the eggs and spices, then pour in the hot hot broth while blending. Lightly frothy, and sooo tasty! That’s such a great idea… I’m going to steal that! Nom Nom Paleo has a great, dead simple egg drop soup with a dash of fish sauce. Yum! One thing I have been adding to my bone broth as it cooks is a “finger” of fresh turmeric. I cut it up irregularly and plop it in with peppercorns. It creates a beautiful golden color with anti-inflammatories of turmeric. The peppercorns are a must with turmeric. They work synergistically. We don’t think the broth tastes turmeric-y either. I’m sold! That’s a great tip. Thanks for sharing! I make mine almost exactly the same with a slight variation. I don’t put in the peppercorns until after I’m done skimming (used to skim them out) and I don’t put in the veggies until 6 hours before done because to me they get a funky flavor if left 24 hours. AWESOME broth!!! Thanks so much for this. Also, White Oak Pastures are great, and the owners are salt of the Earth people. So happy to see you enjoy their products too and share them with your followers! Love your blog! I’m so grateful for White Oak Pastured! They’re the only site I’ve found that reliably has chicken feet in stock. Great to know they’re good people, too. YAY! Thanks for sharing this! So, how do you manage the creepy chicken feet? Do you peel them? Take off their toenails? Is it less complicated than I’m making it? Thanks! When you get the chicken feet from the vendor, they should be ready to go! They have to process them — I think they usually singe a layer of… something?… off the feet before packaging them. I have read that some people remove the toenails; I’ve never bothered. The ones I buy online are super clean and ready to be cooked. Hope that helps! I don’t have a skimmer recommendation — sorry! — but this is the strainer I use. It’s very light weight, but I like it because the mesh is very fine, which is great for broth. http://amzn.to/28xnb88 Have fun with your witch’s brew! 1–I keep seeing people online asking about adding water as they go because the water evaporates? 2–Some people say don’t boil it at all because it makes it cloudy? 3–I take it the veggies, chicken and bones have to be discarded? 1. If you add more water during the cooking process, it will not gel because the additional water dilutes the broth and collagen. 2. That may be true! I always bring my pot to a boil for a second, then reduce the heat and it’s not crystal clear, so that may be why. If that matters to you, try not boiling and see how it goes. 3. Yes, I always trash the dregs. If I’ve used very meaty bones, sometimes I toss the veggies, then do another batch with the same bones. It doesn’t taste as good, but it still has nutrients from the bones. You can reuse bones until they fall apart. Mission accomplished, and thank God because the stress and anxiety of even starting this was just ridiculous. I ended up using your exact recipe, but using only two large chicken backs from my local farmers’ market (and I also have a 16 quart pot that someone gifted me). I left it on the stove for 32 hours and it turned out great. I am lazy and used a funnel to get the broth into the mason jars. The only thing missing was salt. Do you add to the mug you are drinking? Hooray! Congratulations on conquering your hesitation. Enjoy that broth! Yes, it’s best to cook it without salt, then add the salt when you drink eat or add it to recipes. It can get bitter and weird if you add salt during the long simmer. I love the idea of giving Jamie Oliver a run for his money 🙂 Thanks for the sweet compliment! I also roast bones, wings, etc. before (unless I am using a roasted chicken carcass) as it gives better flavor and color. Any concerns about leaving the stove on while sleeping? Do you leave it on when not home? I’ve made broth but for not long enough for fear of leaving it unattended… And it isn’t as flavorful. I have a gas stove, if that matters. And the Crock Pot just isn’t big enough! I also have a gas stove, and no, I don’t really worry about it leaving it on overnight or when I’m not home. The gas stove has a pilot light, so it’s essentially “on” anyway. The flame is VERY low, and it’s covered by a heavy, enormous pot. If you have kids, a frisky dog, or another strong, curious pet, you might not want to leave it unattended. I have cats, and while I know they are mischievous on the counter, I think they would stay away from something hot. Many thanks! I’m about to do my first Whole30 and your books and meal plans and everything have been SO helpful!! I’ve made beef bone broth once before in the slow-cooler but wasn’t to keen. I found that I’d make more use of chicken bone broth. I have a 6 quart slow cooker and was wondering if I still add enough water to cover the bones or slightly less because much won’t evaporate during cooking? Use the same amount of water–just cover the bones. IF you flavor the broth with salt after it’s done you can use it instead of stock in recipes. Enjoy! oh man, i’m never gonna get off this page!! one more for the pantry. 1. Do you use the cider vinegar just for flavor or other reasons? 2. Why cook it so long? Is that the difference between “bone broth” and just soup? I’ve made chicken soup/broth before and just cooked it for however long I had…2 1/2-3 hours and it was delish. But does the longer cooking time create elements or texture? 1. There are conflicting opinions among broth makers whether or not it’s true, but the vinegar *may* help break down the bones to get them to release the most minerals. Some chefs say you can skip it. I include it just in case becasue it doesn’t affect the flavor. 2. Regular broth and stock can be simmered for much shorter time. Bone broth requires a long simmer to release the minerals and collagen from the bones. If you’re just looking for homemade broth, you can go with a shorter simmering time. If you want the health benefits of bone broth, it needs to simmer for much longer. Another good store-bought broth is Imagine Foods, http://www.imaginefoods.com/ Sprouts and Whole Foods carry it, and the ingredients all look good. Imagine is a subsidiary of Hain. I’ve picked up two different ‘organic’ Pacific broths that listed added sugar, so I’ve switched to Imagine preferentially. It takes me a couple of months to build up enough bones and ‘stuff’ to make broth, and I end up buying it most weeks. Do you use all the skin when using a chicken carcass or do you remove? Sometimes when I make bone broth it gets very dark and does not taste good at all, bitter maybe. Ideas on what causes that. I usually remove the skin because it’s so fatty and will just have to be skimmed off later—but it doesn’t matter that much. Make sure you don’t put salt in while you’re cooking the ingredients. Leave the seasoning for after the long-term cooking is done.